If the Bulldogs' offense comes around, watch out. On the road for their first northern road game since 1965, the Georgia Bulldogs came out with a hard-fought, 20-19 win over Notre Dame that was led by their defensive front. The big storyline was how true freshman quarterback Jake Fromm would do in his first career start. He struggled. Fromm did exactly what you thought a true freshman would do and he had his ups and downs. He finished 16 of 29 for 141 yards with a touchdown, one interception and a fumble. Fromm’s fumble led directly to Notre Dame’s only touchdown as it gave the Irish a short field and Brandon Wimbush cashed in. But his interception ended up being harmless. Fromm is certainly a great option to have for Georgia, but Jacob Eason needs to be the starting quarterback once he returns from injury. But eventually, who knows which QB will end up being the starter? One of the top highlights of the week (and probably the season) came when junior receiver Terry Godwin made an Odell Beckham Jr.-type catch for a touchdown and immediately had Georgia fans making comparisons to A.J. Green. Last Wednesday, I said that Georgia’s defense would keep them in the game, but that the offensive line had to play well. As it turns out, the offensive line just had to keep Georgia in the game so that the defense could win the game for them. 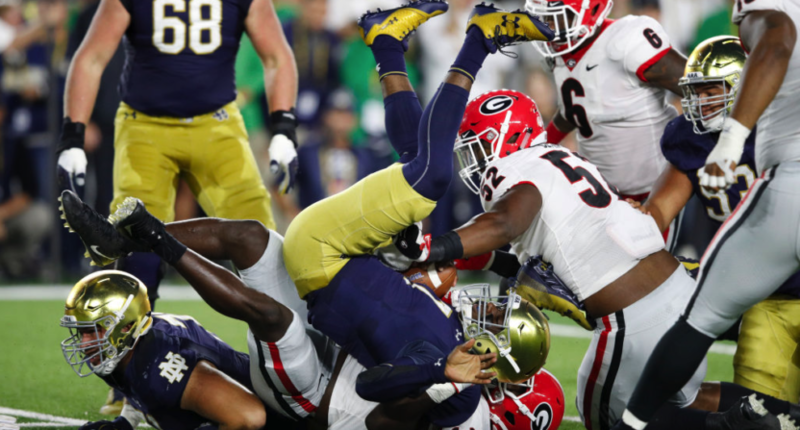 One week after the first-string defense held Appalachian State scoreless (two late turnovers helped the Mountaineers score on the back-up defense), the Dawgs defense kept Notre Dame from doing what they wanted and made it a very long day offensively for the Irish. The Irish want to run the football and base what they do off the run. Georgia held them to 55 total yards rushing and just 1.5 yards per carry. When Georgia needed a big play or a big stop the defense came through. With the exception of the short-field TD, the Irish was held to just four field goals. Roquan Smith was all over the field, but it was Lorenzo Carter who had the coming-out party Saturday night. Carter is a player who has always been gifted. He’s usually in the right place at the right time, but he’s struggled to “finish.” On Saturday, he came up with a very timely sack and fumble recovery and then sealed the game with a fumble recovery on Davin Bellamy’s key sack that ended the game. Georgia clearly has work to do on offense. With skill position players like Nick Chubb, Sony Michel, Terry Godwin, Mecole Hardman, D’Andre Swift and others, there is clearly excess talent to work with. Until the offense catches up, it’s the defense that’s going to lead this team to wins or losses. The unsung defensive front of Georgia (Thompson, Rochester, Clark, Atkins) clogged up the middle and stuffed the run which let the playmakers like Smith, Carter and Bellamy make the plays that won the ballgame for Georgia. This was a big win for Georgia in what was surprisingly a not-so-hostile environment, due to how well the Georgia fans traveled and procured tickets to the game. Notre Dame is coming off a bad year, but any time you can go on the road and get a win against a team with the pedigree of the Irish, it’s something to put in your cap. Kirby Smart has Georgia headed in the right direction. Dry humorist, craft beer enthusiast, occasionally unbiased SEC fan, UGA alumni, contributor for The Comeback.